America's most dysfunctional family are to be honoured with their own stamps, the US Postal Service has announced. The Simpsons characters Homer, Marge, Bart, Lisa and Maggie will all feature on the five 44 cent (31p) stamps. Artwork for the images was done by the cartoon's creator Matt Groening and will be available for preview from 9 April on the post office website. The stamps will help celebrate the US's longest-running prime-time comedy's 20th anniversary this year. "The Simpsons are American icons, quite frankly," United States Postal Services spokesman Mark Saunders said. "We're excited about it, and we think America will be, too. It's a great opportunity for us to reach a new generation of stamp enthusiasts." The Simpsons is the first ongoing prime time show to be given its own series of stamps, Saunders added. The Postal Service receives more than 50,000 suggestions for stamps each year, but only 20 are issued by the government. A date has yet to be announced as to when the stamps will go on general sale. 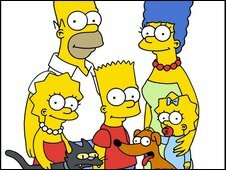 The Simpsons was first shown in December 1989, and made its UK debut on Sky in September 1990. Since then, more than 400 episodes have been broadcast.